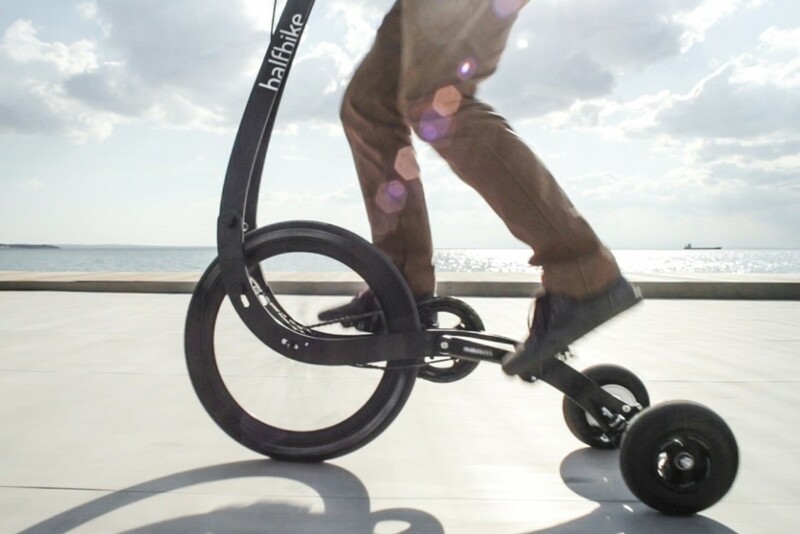 Halfbike II is an urban mobility vehicle that aims to awaken rider’s natural movements. Redesigning everything apart from the core driving mechanism of a classical bicycle, they created a vehicle that affects the way the rider perceives movement and enhances their senses. “The two are so different that they’re actually hard to compare. The feeling of riding a Halfbike is really nothing like riding a bicycle.” Klenov says the main advantage of the design is its portability, adding that it was also a lot of fun to ride. The standing position brings the rider closer to natural walking, with Halfbike acting as an extension of the body in order to enable a smooth and clean ride. It aims to provide a different outlook of the city, whether it is used for commuting, exercise or recreation. Riders can enjoy the experience of learning how to handle a Halfbike from scratch and then improve their skills to explore new horizons. The vehicle offers a one-of-a-kind feeling whether you are a beginner or a pro. Halfbike II is light, compact, and easy to carry. It weighs under 18 pounds and is foldable so can be taken onto most public transit systems or packed into the trunk of a car. The frame is made of aluminum and is laser cut, making it light yet strong enough to endure years of riding. The team developed a special technology to ensure all of the plywood pieces stay intact whatever the weather and riding conditions. The rest of the components are carefully selected and tested high-end bicycle parts from a range of well-renowned manufacturers. Halfbike II is currently raising funds on Kickstarter, where it has almost doubled its goal. The bikes are available for a pledge of $399, and will retail at $599 after the campaign.